Paolo Uccello - TripImprover - Get More out of Your Museum Visits! 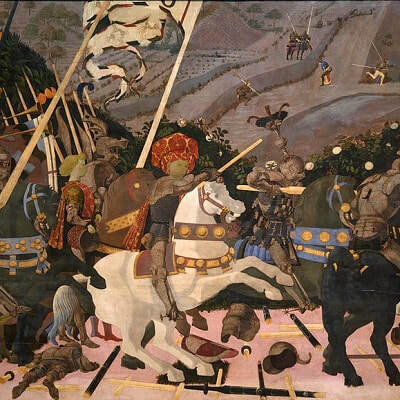 Who is Uccello? 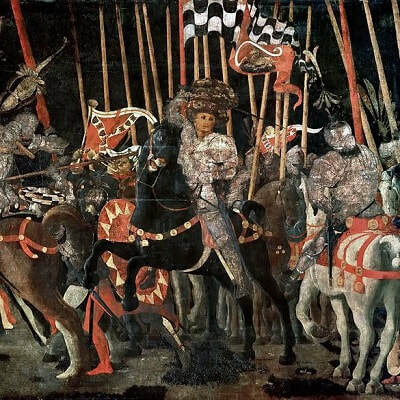 Paolo Uccello (1397-1475) was born as Paolo di Dono in Pratovecchio in Tuscany. In his teenage years he was an apprentice of Lorenzo Ghiberti and later he got influenced by contemporaries such as Donatello, Brunelleschi, and Masaccio. 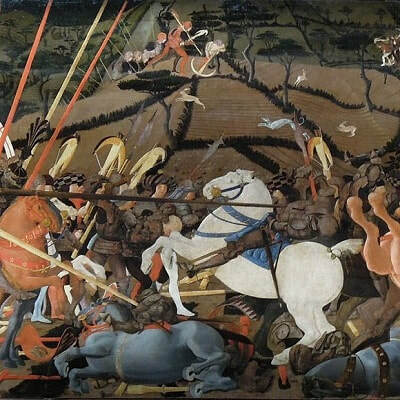 He was named Uccello, which is Italian for ‘bird’, because he liked to paint birds. He developed strong scientific interests and was very interested in representing perspective in paintings, something that he and contemporary artists just introduced to painting. The appropriate use of linear perspective was often more important in his paintings than what the painting should represent. In his paintings he combines elements from the older Gothic tradition (the decorative parts) and the newer Renaissance movement (which introduced depth and perspective).